Gutters are ugly. There’s nothing else to be said on that topic. 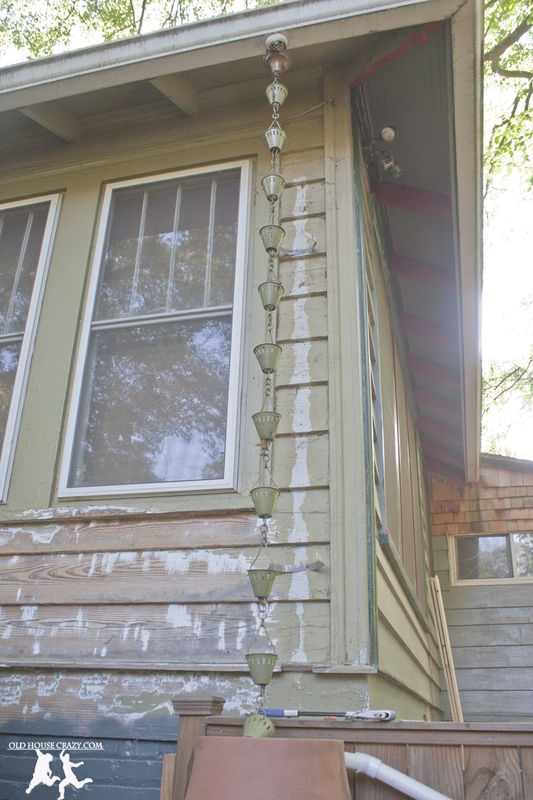 You should all remove your gutter downspouts and replace them with rain chains, which are not ugly. They also help the environment. See, when water falls ten feet down a gutter, it’s moving at nearly the speed of sound when it gets to the bottom (trust me, I’m a physics teacher). 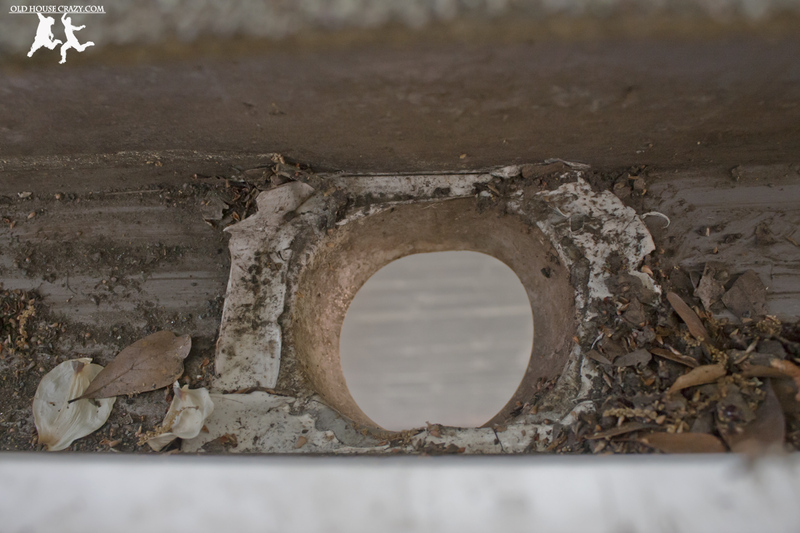 This causes it to wash away dirt and stuff and can lead to erosion around the foundation of your home. This is bad. 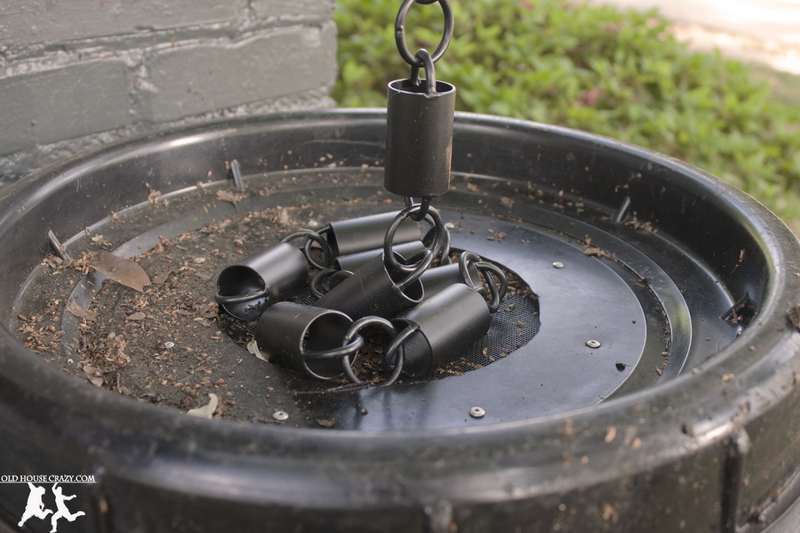 Rain chains cause the water to trickle down that 10 foot distance and land gingerly at the bottom, where you’ll either channel it into a rain barrel or some other crafty water channeling device, like a ditch or a pipe. Just make sure it moves away from your foundation. We use the barrels to water our gardens and sometimes the grass. They’re especially useful during the hot summer months when it doesn’t rain very often. The barrels fill up completely with just a few minutes of rain. It’s surprising the first time you see them fill up. 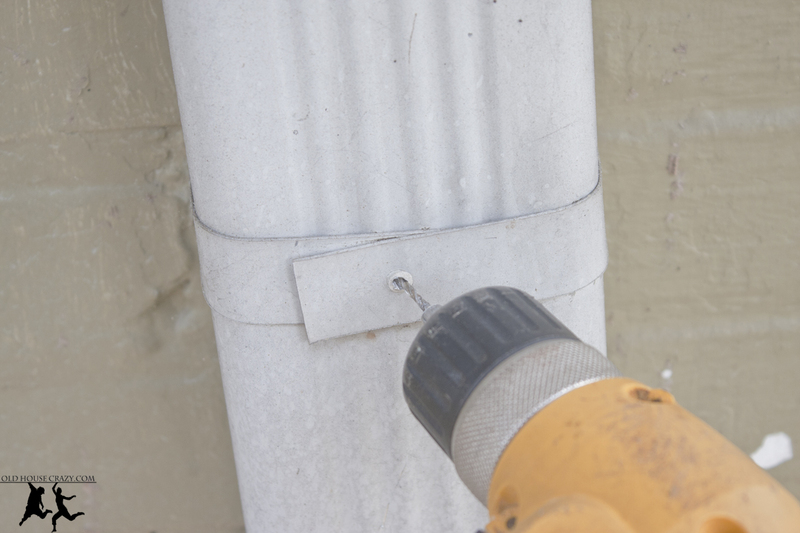 It took me a good while to figure out how to take down my first downspout. There were no screws or nails, only these little circular thingies attached to the straps holding the downspout to the wall. It took some thinking before I figured out I could use a little drill bit to drill straight through the guts of that fastener and pop the strap off. 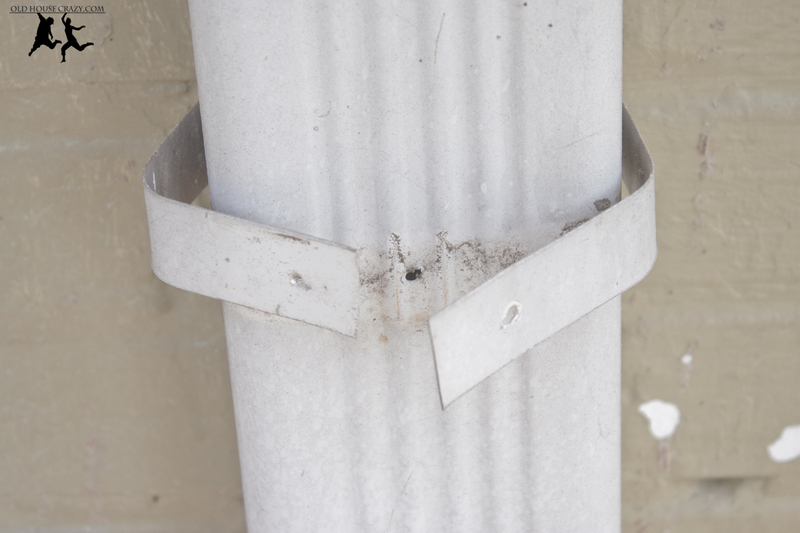 After the straps are removed, the downspout pops right off the wall and disconnects from the gutter easily. The next order of business is to build up a base for the rain barrel. 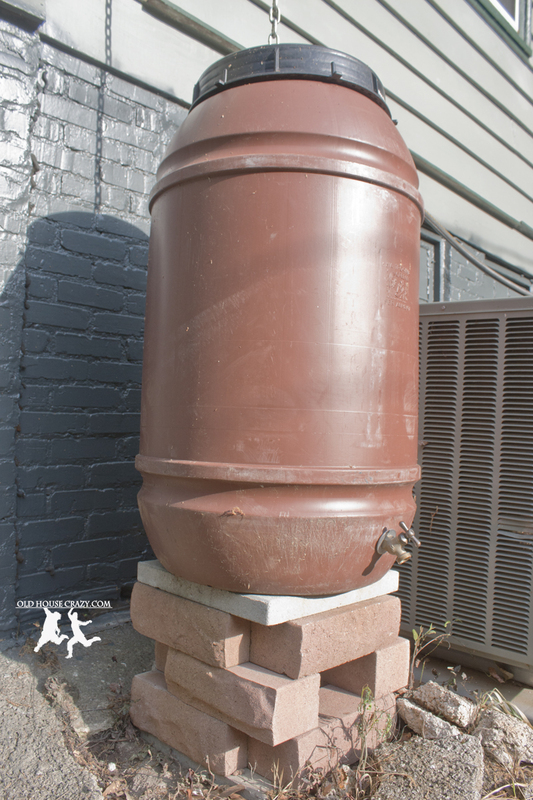 When I installed the first rain barrel at our house, I set it on the ground and let it fill up before I realized we couldn’t get a watering can below the spigot. Skip that step if you install one at your house. Go to the hardware store and pick up some landscaping stones, whatever’s cheap. I spent 12 dollars on the 12 stones holding up the barrel in the photo above. They’re just sitting on the level ground (use a shovel). Other than gravity, there’s nothing holding them in place. 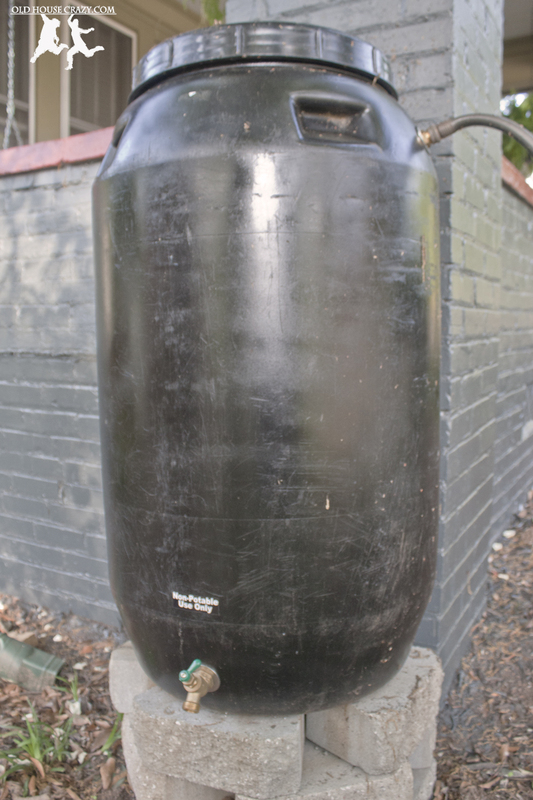 When picking out a rain barrel, we look for a few things. We like them to be at least 50 gallons. Anything smaller will get used up too quickly. We also look for metal hardware and a good screen on the top to keep out leaves. We’ve got two like the one above. They came from Whole Foods and cost about a hundred bucks. They’re old olive barrels and still smell like olives when you buy them. There’s precisely nothing fancy about installing it. 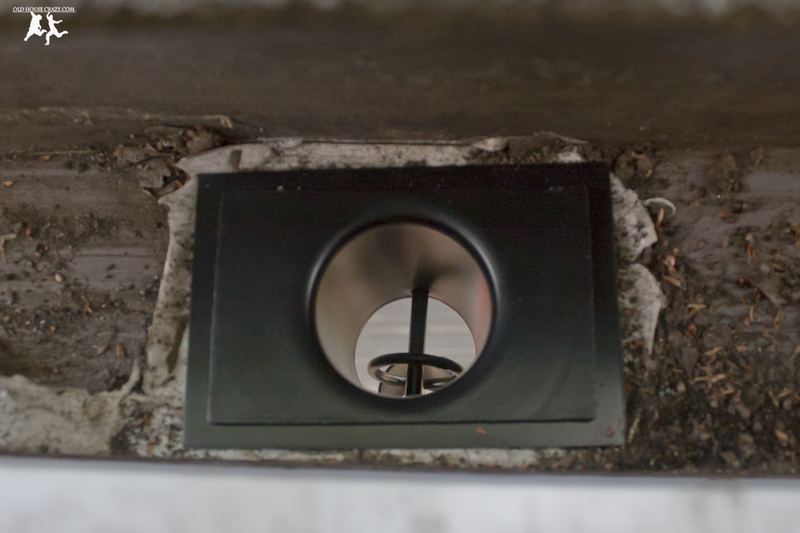 Just set it on your base below the hole in the gutter. Above you can see the hole in the gutter. Water will fall out of the hole in all directions if you don’t channel it a little. When you order your rain chains, you’ll probably be offered some type of channeler or condenser. Buy it. It looks like the one below. 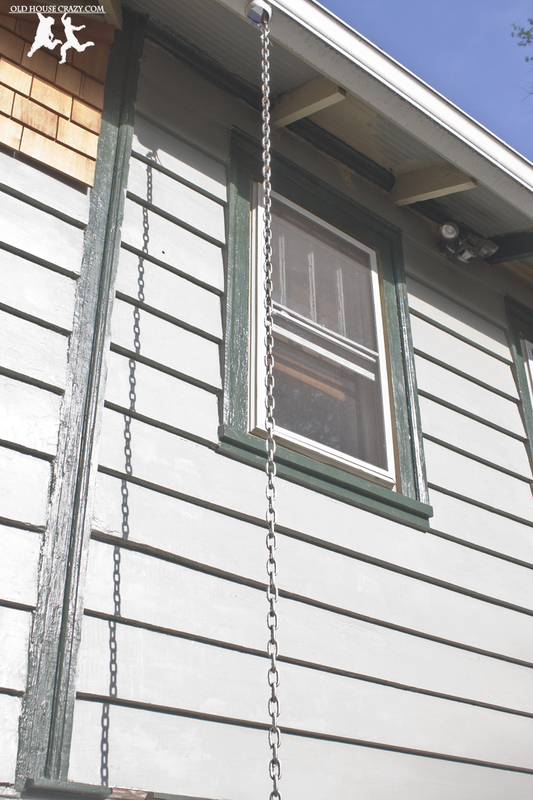 The condenser goes over the hole in your gutter and holds the rain chain, making sure that all of the water travels down the chain. It’s really simple, but necessary. I usually let the extra rain chain collect in the lid of the barrel. You can cut it to length if you like. I like the extra length because it helps keep the chain in place during a storm or strong wind. This entry was posted in DIY, Don't Hire a Professional, Eco Friendly, Exterior Maintenance, Garden, Gutters and tagged DIY, diy project, eco friendly, Gardening, Gutters, rain barrels, rain chains, watering. Bookmark the permalink. Nice use of the rain cistern idea. I really like the use of the chain instead of the gutter downspout. It adds a very classy appel to your home. Plus, its less you have to worry about as far as something clogging it up. Great Job! Thanks! That’s exactly what we’ve found to be true. Leaves do clog the chains on occasion, but a quick shot from the hose clears that right up. If you do a quick google search, you’ll see that rain chains come in a huge array of styles and shapes to fit your home and style. Where can I buy the channel or condenser please? I would try Amazon.com. I believe that is where I got mine. Thank you for the excellent article! I just purchased chains today. 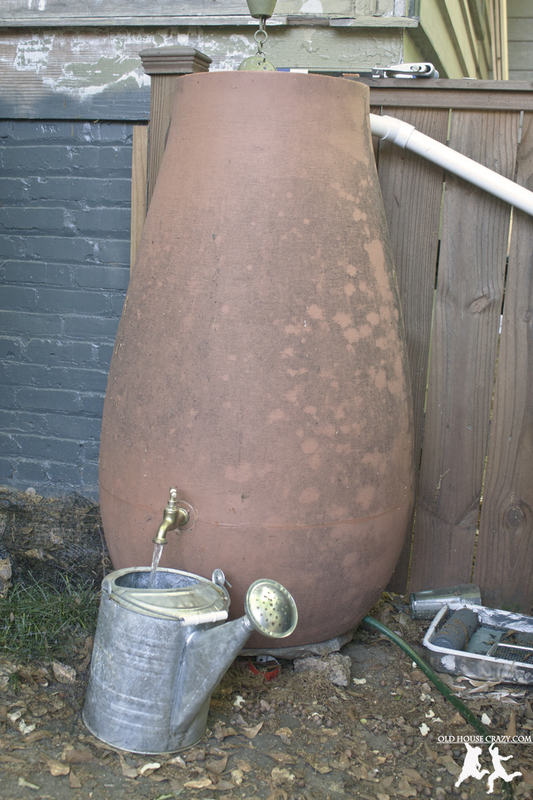 The ceramic-like terra-cotta colored container w / spigot… LOVE it! Where is it from and did it come w spigot? Thanks for reading. We got the fake terra cotta rain barrel off of amazon.com. it did come with the spigot, but required a little bit of assembly when it arrived. I had to screw the spigot into the barrel with a little plumber’s tape. I have noting against the idea of rain chains. They are aesthetic and beat a down pipe hands down (pardon the pun!). However, the statement that water falling down a pipe nearly reaches the speed of sound is way off the mark. Any falling object, water droplets included, can only accelerate at g, the acceleration due to gravity. On earth that 9.8 m/s/s. So for a 3 metre drop, the speed at the bottom will be nowhere near 1000km/hr – the speed of sound, even assuming the drops don’t reach terminal velocity before reaching the ground. Thanks for the installation hints. I’ll be installing my rains chains soon. Sorry for the confusion Chris and thanks for the explanation. Aside from being a physics teacher, I’m also rather sarcastic and it occasionally gets me in trouble. Your explanation is spot on. but the problem I see with these is that the small 1″ hole at the bottom of the cone would reduce the amount of water able to flow through them thus making them overflow from very heavy rain and also I would think they would get blocked all the time due to leaf litter from the gutter as I live in a very forested area and always have leaves in the gutter.The other choice would be normal chain but I think with heavy rain they would not work very well.I also think the gutter cone reducer to hang the chains from would be a bad idea as I would think it would reduce the amount of water that can flow from the gutter,when I get heavy rains I need the water to run from the gutters as quickly as it can to prevent the gutters getting too full of water.Any feedback would be greatly appreciated. We’ve had similar issues with really heavy rain storms. If it is a really heavy rain, our chains still channel most of the water, but there is a lot of splashing water that goes in all directions. If you’re set on chains and still have some room in your design, think about building a home with deep eaves so that the splatter from heavy rain doesn’t get to your foundation. 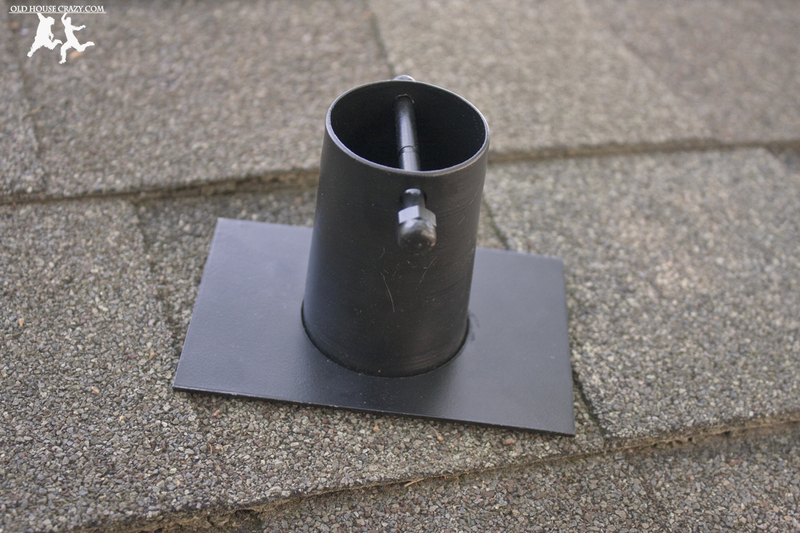 Leaves can be a problem with clogging up the holes, but leaves also clog gutter downspouts. I haven’t solved the leaf problem yet. I still have to get on the roof and clean out the gutters twice a year. Not so much a comment but a question. How did you get the spigot in the bottom of the large black barrel? They are so deep and I can’t reach to screw the back to the inside. Those barrels came pre-assembled. We bought them at Whole Foods. How do the rain chains function if/when it freezes? Do you end up with heavy ice hanging off the gutter? We’ve had them ice up before and yes, it hangs there. That could certainly present a problem if it rips down a gutter, but it hasn’t happened us. 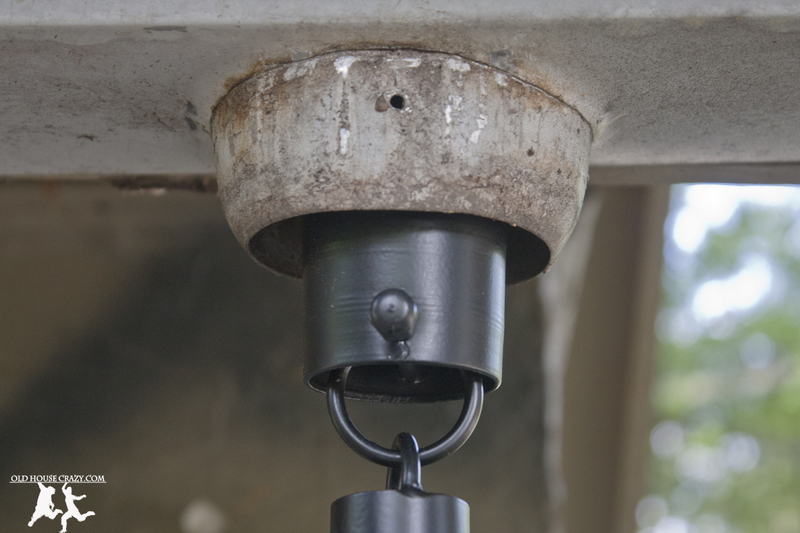 Also, are there issues with the rain chains flapping about in wind storms? Thanks for the quick reply! We’re thinking of using rain chains in a place where it would be very difficult to tie in the gutter to the downspout system. We live in the NW and there’s a lot of rain here, so controlling where water goes is very important. Ours aren’t actually done in the best way. The chains simply hang to the ground and there’s about a foot on the ground. It works fine for our application and weather. If you’re concerned about lots of water and wind, consider making a gravel well and anchoring the chain into the gravel. As I understand it, that involves digging several feet down and filling the hole with gravel and an anchor for the chain. 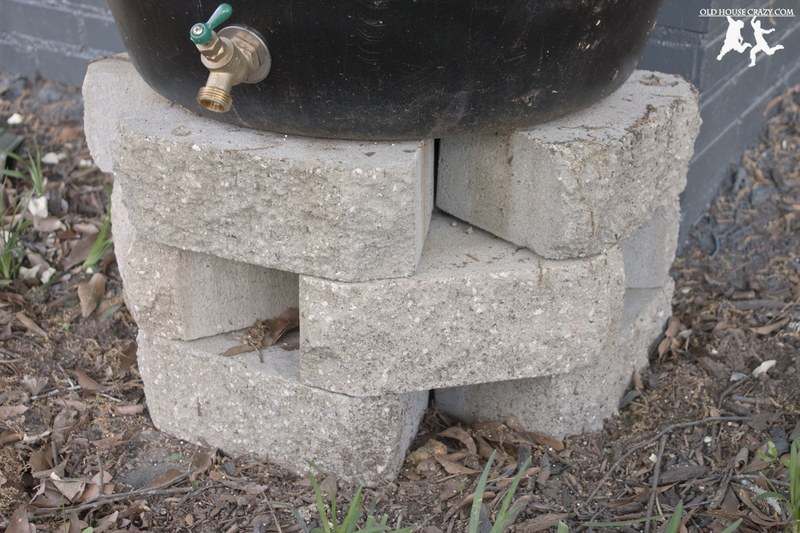 You could also bury some drainage pipe or French drain within the gravel to channel the water away from your home. 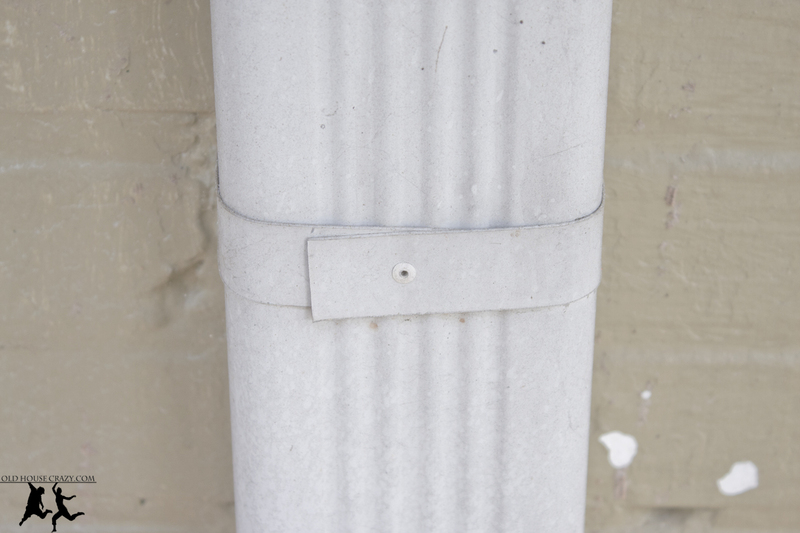 FYI: “these little circular thingies attached to the straps holding the downspout to the wall” are called pop rivets. But you know that, don’t you? Don’t you? What about mosquitoes and standing water. I live in the south. We live in the Atlanta area, so mosquitos are a real problem around here. Our barrels all have mosquito screens on them so we have had any issues. If you leave them open, mosquitos will lay eggs in there and it’ll be bad.